They appear little more than a bunch of old black-and-white photos the size of an A4 sheet of paper, with poorly defined images of armed men, battlefields and lifeless bodies. But this collection of pictures has immense historic value. They are the first ever photographs documenting a war in Latin America. They show the War of the Triple Alliance, a conflict which raged from 1865 to 1870 and which pitched Paraguay against Argentina, Brazil and Uruguay. It was one of the deadliest military conflicts in South American history with approximately 400,000 fatalities. In Paraguay, which lost more than half of its population to the conflict, it is also known as the Great War. The pictures are part of an exhibition currently touring Paraguay and commemorating the 150th anniversary of the start of the war. But they were taken not with history in mind, but for purely commercial reasons. They are, in fact, part of an unusual business venture launched by an American of Irish descent called George Thomas Bate. Mr Bate had opened a photography shop in the Uruguayan capital Montevideo in 1864. That same year, Uruguay was rocked by a coup. Paraguay backed ousted president Bernardo Prudencio Berro, while Uruguay's neighbours Argentina and Brazil sided with coup leader Gen Venancio Flores. As he observed the magnitude of the war grow, Mr Bate had an idea. He had recently visited the United States during the Civil War and had noticed a blossoming new trade: the sale of war pictures. Families whose sons, fathers, brothers or husbands had gone to war were willing to pay money for images of the battlefields where their loved ones were fighting. In 1866, a year after the start of the War of the Triple Alliance, Mr Bate requested permission from the new Uruguayan government to send a photographer to the front. The photographer he chose for the task was a Uruguayan called Javier Lopez. Mr Lopez travelled with an assistant to the 100km-wide front line. 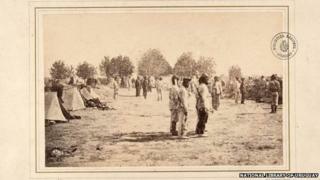 At that time newspapers were not yet able to print photographs so Mr Lopez was the only photographer on the battlefield. Photography expert Luis Vera told BBC Mundo about the Herculean task that Mr Lopez faced. "At that time pictures were taken using a technique called the collodion process, which required an enormous amount of equipment", said Mr Vera. "The kit included a heavy camera, fragile glass plates and chemicals that had to be carried all the way to the battlefields." While American photographers of the Civil War used vehicles to carry their equipment, Mr Lopez and his assistant had to use backpacks. Another challenge was the time it took to shoot each picture. "The photographer had to prepare the wet plate, then take the picture, which required that people photographed stood still for up to 13 seconds, and finally he had to develop the photo in a tent that was used as a dark room," explained Mr Vera. The long time it took to process each image and the impossibility of shooting moving objects explains why most of the photos included in the exhibit are static and show no action, despite it being a war. In the end, the venture turned out to be a commercial failure. Even though Mr Bate publicised the photos in Uruguayan and Argentine papers, historians claim the 22 images compiled in an album called The Illustrated War did not catch the attention of the public, many of whom were against the war. In 1869, Mr Bate sold his photography store and moved to Buenos Aires. There, he tried a completely different line of work and opened a shoe store. His historic pictures of the war became part of the collection of the National Library of Uruguay, which loaned the photographs to Paraguay for this special touring exhibition. The War of the Triple Alliance ended on 1 March 1870 with the death on the battlefield of the Paraguayan president. Paraguay was left devastated, its territory temporarily occupied by Brazilian forces and its population decimated. In 1885 Uruguay became the first country of the Triple Alliance to return its war trophies to Paraguay, thereby normalising relations between the two Latin American nations.